Maybe we can start off with how your investment focus has evolved since the last time you joined us. What are your thoughts on how seed has split into pre-seed, seed, seed extension, and post seed? Are you investing once with a company or reserving for these various stages within seed? You just closed fund 3… tell us about the first two funds that set the stage. Would you do things differently if you could go back? Which raise was the hardest? How did the expectations of LPs change from the early funds to the institutional fund? What surprised you most about the raise? Did you connect w/ prospectives through referrals, cold calls, a combination? Walk us through the metrics… how many targets, meetings, avg commitment amt, etc. Did you ever think you might not complete the raise? What’s the best advice you got on the raise and who’d you get it from? In our first interview, you talked about how you couldn’t get a full-time job at a venture firm. I’m sure you’ve had plenty of offers as you’ve built a track record. Did you ever consider making the jump? When I sent my fund deck to you, you said “Awesome and looks good. As I always say, the deck matters much less than having capital partners who believe in you” For anyone listening that aspires to raise… talk about what you meant by this comment. Nick: #Semil Shah is back to discuss the close of fund 3 for #Haystack. 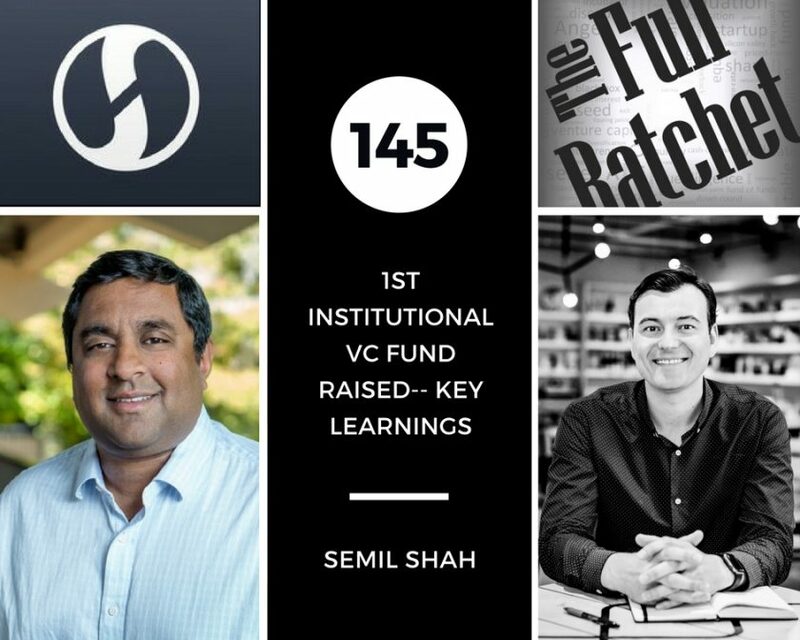 #Semil has joined us before to talk about the path from seed to Series A, in one of the most popular interviews of 2015. He’s an investor in over 70 companies including #Instacart, #DoorDash, #Hired, #Hashicorp, #Giphy, #Envoy, #OpenDoor, #eShares, #Airmap, #Clara Labs, #Wag Walking, and #Managed By Q. And #Semil’s also a venture partner to #GGV Capital and was selected to the Midas Brink List 2017 by #Forbes. #Semil, it’s great to have you back! Semil: Yeah, I’m excited for round two. And I have a feeling that as we do this, well, there will be some questions you ask me which I can’t answer which we’ll do in round three in a couple years. Nick: Alright! Sounds good. So we got your back story on, on venture in the first one. So maybe we’ll just jump ahead and can you talk a little bit about how your investment focus has evolved since the last time you joined us? Semil: Yeah. I mean, I think to, to cut to the chase on that, with a new fund and it’s a little more money than I managed before and it’s an institutional, you know, backed fund, I have to change my stripes a little bit. You know, that means writing slightly larger checks, thinking about ownership, thinking about priced rounds, thinking about my bandwidth, thinking about how I scale as an individual and, and invest in resources to help give me more time and bandwidth. And so, so my investment focus in terms of sectors still remains generalized. I’m still looking for certain types of people really. And I’m, I’m a very people focused, I try to be a very people focused investor. That’s certainly not the only ingredient but one of the main ingredients. So my focus on that hasn’t changed. I think the pacing, the sizing. And what I need around the table to move has changed significantly. We can get into that in this podcast. Nick: Got it. And are you still kind of investing at the same stage early on, pre-seed, seed? Semil: You know, I have sort of given up on trying to say I do this part of seed or that part of seed. And, and you know, your laughter is sort of indicative of how ridiculous it is, right? Semil: what I just tell people I meet, you know how some VCs are stage agnostic? I am a seed stage agnostic. So I can do the pre-seed, the seed, the second seed, the post seed, the seed extension. I, I don’t, I don’t really care. I think what, what I care about is, you know, you can’t control when you’re going to meet somebody that you click with. And so stay flexible and then make sure it just meets my investment parameters. So sometimes somebody could be raising 500K and they just want 5 people to write a 100K check, probably doesn’t fit for me. And, and I wish that entrepreneur luck and they, it’s probably the best thing for them to raise the, you know, 5 checks of, at 100K. Conversely, if there’s somebody who’s raising a $2M seed round and they just want 2 or 3 people around the table with like a really tight syndicate, you know, that, that’s really when my ears perk up. Semil: Well, I think of it as tranching, right? You see tranching in like more sophisticated financial markets where people will say well look I’m going to allocate, you know, $10M to, you know, #Moran Enterprises but I’m not going to give you all 10 of that upfront. And so #Charles Hudson from #Precursor has a great kind of line about this where he kind of just says look, entrepreneurs have to go through more check points now, if you think of it as a race track, or obstacle course, before they can, can go to, you know, let’s say #Accel Partners and say okay here’s why you should invest 10M bucks in my business. Nick: So would you stage your own capital? Would you have an entry point in some scenarios at pre-seed but reserve more capital for doubling down at seed or, or putting more in at post-seed, for instance? Semil: Well, there’s two questions you asked there, which sort of, which sort of warrant their own answer. I think in terms of like pre-seed versus seed, I’m, I’m not sure where I fall on that. I mean, I kind of want to invest in people that start out without too much capital raised, and are, and are starting something and they’re not even thinking about the capital raise. So these kind of pre-seed rounds before someone’s even really done something beyond a deck or like a paper, I don’t, I don’t really like to entertain them unless I know the person. Semil: In terms of like reserving and stuff, and we can talk more about reserves later. Having talked to a lot of very professional, experienced seed investors, and also looking at the data that I’ve been, you know, that has been shared with me from some really well established LPs, it seems like you have to grab your ownership upfront and write it out. And this idea of trying to invest in a lot of things and then watch and monitor what’s working and, and invest more alongside that, it might be a vestige of, of the kind of old Series A and B funds. And I’m just not sure it really works. Nick: Let’s do it. Alright! So you just closed fund 3. Congratulations on that! Semil: Yeah, it’s, it’s technically fund 4 but, you know, the L, the profession LPs, that I spoke to, you know, they looked at me as not someone who is entirely new but it was like the first institutional fund. So I’d say technically fund 4 but really the first institutional fund. Nick: Got it. First institutional fund is closed. Can you tell us how the first 3 sort of set the stage for the most recent fund? Semil: Yeah. I think in the absence of having the most important data point, which is kind of returns, and, and ownership, a lot of folks who are looking in this category institutionally to back new funds, they only have a few proxies to go after and they’re not perfect. And so someone will say, you know, can you get into good deals and only measure that by who maybe follows those deals. Right? What are, who are the brands that follow or you co-invest with? How much do those companies maybe raise as in an occasional quality? And, you know, can you intercept the deal flow? So if, if the LP assumes that the 12 to 20 best funds are always going to catch the best deals, can you, can you get into that jet stream ahead of time? And so I think I was able to prove that, you know, not to everybody but to enough people. I think the problem with that is that it, it, those really are proxies and they may be false proxies. And, you know, it’s too early to tell whether those markers correlate with actual results. Nick: But is that, is that the expectation for the LPs? Is that what they’re evaluating, whether, whether or not they’re, they’re good proxies and good metrics to, to be looking at? Semil: Yeah. I think it boils down, it’s sorts of like where deal flow meets check size in this venn diagram. 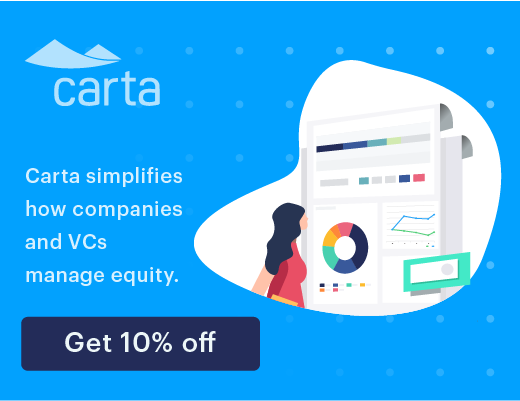 I think the most sophisticated LPs I met and got to know and learn from, they would kind of say okay we have this one circle of deal sourcing, how do you really get your deals? And do you, do you as a manager know how the deals that you do, how did they got to you? And then, two, this other size is like check size. And they just sort of assume that everything below, let’s say, 500, to be liberal, it’s sort of easy to throw around that kind of money. And so really when you, when you get the overlap of those two circles in this venn diagram, that sophisticated LP will look at, you know, the next manager, the next #Semil, the next #Nick Moran and say okay can this guy or gal credibly write a million dollar check for a real ownership, let’s say 8 to 12 points of ownership, in a really good company, right? Because that’s what they want ultimately at the end of the day. And I think, you know, I probably didn’t score very highly on that. I don’t think a lot of people would score very highly on that mark. But that really is the, the key question. Semil: I would, I would say in general like no one really respects it. Like if you were able to, you know, get into #Palentier and #Opendoor early, clearly that’s great but you’re not going to get institutional credit for that unless it was a sizable check. Nick: get some credit for that. Semil: And I think the picking is related to the percentage of investments you make. Right? And so, again, the sophisticated LPs will say okay well sally, you know, she only invested in 10 companies per year at the seed stage. And she hit this many in so she’s, she’s more of a rightful shooter. So they’ll look at, they’ll look at percentage. Nick: kind of the size of those rounds and the quality of investors in those rounds? Semil: Oh absolutely! I mean, that’s all I had to go off of. Right? And I, I knew, and I think the LPs knew, that it’s sort of imperfect but that’s all you have to debate. I was very fortunate on that metric, that conversion metric of going, you know, a known institutional fund to, to follow. I think the issue with it is like in the environment that we’re in, it’s just not really sure what that means. You know what I’m saying? Semil: It, it’s sort of all a big tbd. Nick: Would you do things differently? Semil: Do you mean would I do things differently, a- on the fund raising side, or, or b- on the deployment side? Nick: I actually, I kind of meant both and I was curious which way you’d take it. Semil: Okay. Well, on the, on the fund raising side, clearly, you know, you always learn from the time before. I think if I were to go back and sort of rewind the tape from this fund raise, even though I was very fortunate and did it in my timeline and in a way that I was comfortable with, I probably would have done this pre-marketing, what I call pre-marketing the fund earlier. Semil: Which is just kind of like a heavy socialization. I almost think, you know, I, I did two months of it. I was sort of saying when I wrote the, wrote the post about it, maybe I should do 6 months. I think even longer is fine. So, you know, the, the next time I do it, I’ll do a lot of pre-marketing. A lot of socialization. It’s just that people, LPs, I’ve sort of come to appreciate, are insanely, are, are insanely busy, yes. But their, their travel schedule is actually really, really insane. They inherit, you know, LP advisory commitments, they inherit funds that they have to manage and they literally have to show up all over the world to these LP meetings or to, to meet and check in with their managers. It’s sort of a mess. So you kind of give them a lot of time to acclimate to what you’re going to do. Nick: some LPs are ready to have that discussion. Semil: Yeah. One thing I learned only towards the tail end of this, #Nick, was there are going to be some LPs who look at you or, or looked at me and just said, you know, hey #Nick I might like you, hey #Semil you seem great, I actually don’t believe you will raise an institutional fund, and until you do, then I will take you seriously. Nick: Yeah. It’s a question, I mean, I’ve gotten a bunch of times. Which is why wouldn’t I just wait for your next fund? Semil: Yeah. And all, and if you, if you really step back and put yourself in their shoes, it completely makes sense. Nick: Totally! I, I, that’s like one of the few objections that I don’t have a good counter to. Semil: Yeah, yeah. And, you know, I, I kind of quickly learned in the fund 3, if somebody is like that but you actually like them, go, go help them, go get to know them better. You don’t have to spend a ton of time with them. But just email with them, let them know they can contact you, and, you know, people kind of emerge and they want to get to know people. A lot of the LPs are really, you know, obviously some are very, very connected on the ground to what’s happening. And a lot of them are just not. Nick: could go back and do things differently, how, how would you think about deployment? Semil: It’s a little bit hard because I feel like the three first, you know, smaller funds were a good kind of training ground, sort of target practice if you will. If I could tweak any bit of it, I would have tried to write fewer larger checks earlier. So I would have tried to ramp up my, my sort of ownership and sizing a little bit more, more quickly. But, you know, I, I still think that that’s probably the only thing I would change, which is, you know, I went on this glide path, we’re going 25 to 50, 50 to a 100, 100 to 250, and then sort of following on. I would have just made that curve steeper quicker. Nick: So starting at a, a similar entry point but a steeper curve? Semil: Yeah. Yeah, a little, little bit steeper. But, you know, honestly like when I was starting I just didn’t even know what reserves were or, you know, I was just really thinking shots on goal. Semil: So it was hard to, hard to get out of the mindset. Nick: Yeah. I can’t really argue with your portfolio. But do you think you might have looked at, I mean, hindsight is 20-20, right? But do you think you might have looked at sort of other trends or, or, you know, focused in some other areas that, that may be you missed? Semil: No, I think I was, I was pretty generalized and I tried to, I tried to just meet people and, and move around. I don’t think I really missed trends so to speak. I think I caught actually quite a few. But being early I just didn’t want to be, pigeon hole my fund and activity into like one domain. Partially because I just don’t, I don’t want to operate like that and partially because I’m not sure it would lead to good results. Nick: So between the four funds, which, which of the raises was the hardest? Semil: Oh, this one was definitely the hardest. Yeah. I mean, the first one I didn’t know what I was doing and I just raised from others VCs and friends and entrepreneurs. Second one, well I still didn’t really know what I was doing, and kind of cobbled it together. The third one I tried to make it institutional and I learned pretty quickly that wasn’t going to happen. So I just took out my notebook and met a lot of people and kept my fund open. This one I really prepared or thought I prepared. And, and this was definitely the hardest. Like the most frequent fliers miles, the most hotel nights, the most away, nights away from home, the most kind of curve balls. Yeah, this one for sure. Nick: Yeah. Talk a little bit about that funnel process. Like the stages that you go through. I’m sure there’s a, you know, a prospecting stage and then, you know, you probably do initial meetings and follow up meetings, you know. How did, how did that all work and play out? Semil: There wasn’t really any rhyme or reason to it. I think I did 3 things upfront with everybody that only in retrospect I think really helped, which was I was very consistent with people about the target size. I was very consistent with people about what I would do if I didn’t hit the target. And I was very consistent about when I was going to stop being in market. And so what I found at the end, even though it was like kind of dramatic at the end, the majority of people really respected all those things. Partially because I was very consistent in, in communicating those things. And I stuck with them any time I was challenged on those. And so, because of that I was, I think I was able to like herd some, some cats at the end. But generally I, I got my insiders to commit early and try to build momentum in a bottoms up approach rather than, you know, trying to get an anchor or trying to get the institutions first to say yes. Nick: What was the, the target and what was your plan if you didn’t reach the target? Semil: Yeah. So I told everybody that I was trying to target 25, that I would go up to 35. I didn’t put any sort of hard caps in my dock. But that 35 was like the limit for me because I have some concerns about the math once you approach 40. And, you know, I, I told people, you know, if by the end of June that I had 13 million or 15 million or 17 million, that I would be perfectly happy and I would just go back to deploying it, and you know, we’ll talk the next time. So that I wasn’t just going to sit there and like kind of hang out in market. Nick: And did you have, with your strategy for deployment, did you have ownership percentage targets? Do you have a reserve strategy now? How, how does that all look? Semil: Yeah, I mean, I told people that I was going to move up the next rung, in terms of, on the ladder, in terms of check size. Because you know, let’s say between 250 and 750. And that I was going to be ownership focused for the first time but not, you know, not in a greedy way, just, I would say 5 to 10 points of ownership. Nick: fund. You know, how did their expectations change for, for what they were looking for? Semil: Well, you know, if you, if you go through the hierarchy of why people say no, you know, obviously there’s just a bunch of people who’d, who either by community or by religion are both down to single GP funds. I don’t, I don’t blame them. There are a bunch of people who think the seed stage is just, you know, it’s silly. Like why would I put my money there? Right? Semil: I’d rather give 10 more million dollars to #Mayfield, you know. They know what to do. There’s, there’s also a feeling in the Bay area that the Bay area is kind of bonkers and you, you know, this is before people had been talking about how much foreign money is here and how much more money is coming here. So you combine all those things like single GPs, seed stage, Bay area. For a lot of people it’s just like wow, you know, you, you’re telling me three things I just don’t want to hear. And honestly, I can’t, I cannot blame them. Cannot blame them. Nick: Did you pitch anyone that had never had an allocation to venture capital before and convert them into the fund? Semil: No. No. I think that would be, yeah, you shouldn’t, you know, no new manager should to be talking to anybody who doesn’t have an allocation in venture before. Nick: stage. But you, you’ve never had a family office take a first shot? Semil: No, no. Maybe that’s just luck of the draw. I actually think these smaller funds are perfectly set up for family offices. But, you know, probably hard, hard to find that match and have things line up. But, no. I only talked to maybe two or three just out of everybody, that I really like the groups. But they’re, they’re a little bit more of an opaque market to kind of understand. So I, I honestly just didn’t spend much time in there. Semil: endowments. Fund to funds, endowments and foundations. Not pensions and not families. Semil: So, so once we go through the Bay area and seed and single GP, definitely fund size like, you know, a lot of people would say we go into 150, we’re going to under 100. Check size issues is definitely, definitely a concern. I think also climate, climate wise, people haven’t seen returns that they’ve made in, in the seed category starting in the early 2010, 2011. So they’re kind of waiting. And I think this, this sort of opens up a whole different pandora’s box of, of issues around overall liquidity- a, and b- liquidity for seed investors. There’s just, it’s pretty hard to come by. So you, my view is like all seed managers are going to have to manufacture liquidity moving forward. So that means that #Nick, if you and I have a fund, we run it together, we have to become an expert in one, selling our companies, right? Semil: And two, selling into future rounds, should we be so lucky. And, you know, I’ve had a little bit of experience with that, just trying to like learn and flex those muscles. And being involved deeply in the sale of a couple companies that I’ve kind of pushed to do that. And also liquidating shares in, in a few companies, partially to like get liquidity from my LPs, partially to flex that muscle and understand how those things work. Because I have sort of had a feeling in the future that those are going to be the kind of skills that would be required stable stakes for playing here. Nick: Yeah that, that brings up an interesting point. So very recently we’ve had a couple portfolio companies raise A rounds. And when they did that, the A investors offered to buy us out of our position. So, you know, do you take a quick 5 to 7x return on, you know, less than 18 month investment, or, you know, how have you thought about that as you’ve gotten opportunities to, to early exit? Semil: Two ways. I think rule of thumb is like, for me, if you can book a 20x return in less than 2 years, it seems, 20x or higher, it seems hard to argue that you wouldn’t take some off the table. Now again, every situation is specific. So you could have a company where you have a lot of conviction in it or it’s already de-risked to the point where you say look I want to ride it out. There’s also this consideration of well, how big is your fund. And so obviously the bigger your fund, you have, you have a much narrower path to play in that game. Because you need to ride out the winners. Nick: Right. So what surprised you most about, about the raise? Semil: I think looking back, what surprised me the most was that even though I had prepared insanely and tried to cover every detail, that really people have an incentive to just not move. And so getting people to move is really, really hard. It, it is a persuasion game to the max. And, you know, I had to kick into another gear that I, I have personally hadn’t had to do before. So that was kind of the surprise. Nick: point it out for us. Semil: It’s kind of always be selling but just like, you know, this, this idea of like when a conversation is moving and someone happens to be in Pittsburg or DC or, or Boston, it’s totally in bounds to like get home on a Friday night from a trip. You’re texting with somebody that you’re talking to and they’re like hey we’re all going to get together and discuss, see you on Monday. And you’re like you immediately text back and say well I’m actually going to be in New York this week so I’ll pop over. And, and you’re not going to be. Semil: And you kind of text your wife and you’re like hey I’m on the Red Eye tonight. And you go. Semil: And, you know, so part of that is in a weird way kind of addictive. Like there’s this kind of adrenaline that comes from that, which is kind of exciting, where, you know, I remember a couple times on the tarmac as I was like getting ready to like take off on a flight. I was booking another flight, you know what I’m saying. And that was kind of like kind of fun for a bit. Definitely harder when, you know, you have little kids at home and, and all that. So, I think I, I think over the six months I was like 28 nights away from home. 2 of those were Red Eye’s. So it wasn’t too bad. It’s just not my style, you know. So, so that was a change. Nick: Yeah. The, the adrenaline on the VC side is, is very high but then the adrenaline at home and the, the level of activity and just being on is also very high. So I wonder how long I can burn at both ends. Semil: Yeah. Well, I’m sure you’ll find a way. Nick: So did you feel like the conversations with LPs, was it ever an education? Because many of these LPs are not at deep in the asset class as, as you are. I mean, you’re writing a, you’re writing great content on a very frequent basis. You’re, you’re in the thick of things, in the community, specially at the seed stage. And the expectation really can’t be that, that LPs are as deep at your stage in your sectors, and even on, you know, portfolio strategy and, and what not. So is the sales process to some degree an education process or did you find it was mostly just, you know, selling yourself against others and they kind of had a good sense for, for what winning looks like? Or, you know, how do you think about that? Semil: There were a few people where, you know, there’s sort of gradients. There’s a few people that just didn’t know what was going on. And I would just turn into sharing my, my point of view. There’s some people who are, who are quite skilled and experienced about the larger venture firms but not understanding what’s happening at seed. So I’d share a little bit more. There’s some people who were, you know, deep, deep into seed. And so for each one it was like a different conversation. So it just kind of depends. It just kind of depends. Nick: Did you feel like you were selling the stage in the asset class or were you selling #Semil? Semil: Oh, definitely the latter. I was, I was saying, I was sort of saying like look I don’t, I don’t have this formal background or background that makes sense, here’s how I kind of cut in, here are the different things I did, here’s how it kind of came together organically, and here’s been the trajectory over 4 years, you know, let’s, let’s try to model it out over 10, 20 years what could it look like. And so it was much more the latter than saying hey, you know, see this is a great place to be. I think it was much more an investment in me than those other things, or I’d like to think. Nick: And how were you doing your prospecting? Is, was it all referral based, were you cold calling, accommodation? Semil: So I, I might have mentioned earlier that like doing fund 3 I tried to raise 20 million. Quickly realized in 3 months that that was not going to happen. And so I went and I met with a lot of LPs. I kept my fund open knowing that they would all saying no, just to take the meeting and like learn from them like who they were, what they were looking for, all, all that stuff. And so I knew a lot going in. And then I was lucky that a lot of people who have mentored me have started their own funds before and really spent a ton of time with me. And, you know, these are pretty well known funds. So they were able to introduce or put in a word for me, you know, that, that I was just very grateful for. Nick: You know a lot of the, the people that have raised funds that I have chatted with have talked about sort of the issue of getting people from, from maybe to yes. You know, how did, how did you create urgency in a situation where there is no urgency for your targets but there is urgency for you? Semil: I kind of just, like I was mentioning before, I just very clearly communicated that at the end of, the end of the campaign, it was going to be at this specific date, and that I would expect people to register their interest or their desire to pass by that day. And I, I just kept saying that over and over again. And I, I think, I think it, not, I won’t say resonated with people but I think people just respected that for the most part. And I think they believed me when I said if I had, you know, just way short of the target, that I would just continue to forge ahead. Nick: And walk us through some of your metrics. How many targets, how many meetings, you know, average commitment amounts? Semil: I would say I spoke with, either on the phone or in person, with over 200 potential LPs. Semil: I would say the majority of those tracked to second or third meetings. I would say I kind of got into heat or like due diligence with about 12 groups. And I had, let’s say, one, two, kind of what I would call five institutional partners commit. And they were all really, really different. All very different levels of diligence, different makeup like that. And then out of, out of the seven or so that, that didn’t, it could have very easily been more, it just sort of things happened and curve balls happened and just didn’t make it over there. But it was a, you know, to answer your question, very tight funnel. Nick: Well, maybe you got a lot of warm, warm meetings for fund 5. Semil: I think so. I mean, again, I think we go back to your, you know, to the comment I made about, you know, hey I don’t, I don’t think you’re going to raise this one so call me when you do. There’s a lot of wisdom in that. Nick: Yeah. Did you ever have a moment where you, you thought you might not complete the raise? Semil: Yeah. I actually like tweeted out this graph because a lot of people were asking me like what was it like emotionally. And I thought about writing it. And then I was like so I just drew this graph on my iPad of like tracking the emotion over time. And so there, there were like 3 points at which I remember as being, I won’t say difficult but like I was, I was not as confident as I would like to be. So I’d say in the first month I got this kind of omen that somebody that I had a very close relationship with built and who they only had a few managers and all those managers I happened to know pretty much really well and they all advocated for me. They just kind of brushed me off very early in January. So I remember thinking like oooh that’s a bad sign. And I got that bad omen early. And then midway through I closed all the individuals and I thought maybe I could get up to a decent amount and tell people in queue two like, hey, look I’ve closed this in queue one. And I, I just remember going back and forth with the lawyer like thinking like that can’t be the number. And so I like I had just raised like almost as much as my previous fund in that first quarter. So that felt a little bit deflating. And then right at the end, probably in like the last month, I was like this just isn’t going to happen. And so I kind of hit this low point. And then, you know, I was like, look, just close out the last month, you have two trips set, just go, you know, leave it out on the field as they say. And I did that and then the last like I want to say 8, 8 days it just hit like, you know, the 8th, the 8th last day, the 7th last day, the 6th last day, it just boom, boom, boom, boom, boom. So very, very lucky. Semil: Yeah, I mean, I’ve been part of companies that have, you know, raised money or co-foundered them or been part of them and raised these funds. So I, you know, I think the empathy reminder is always good. But I think it’s actually something different. I think it’s more like it’s deeper awareness about relationship and commitments that impacted me. So yeah, it was, it was different. I always wonder like what will, you know, who would I be like, what kind of person would I be if it was just kind of easy to raise funds, right? Versus just trying to, trying to, trying to scorch the earth to pull together a little bit of capital. So it definitely can change you. Nick: What you mean by that comment? Like deeper relationship, commitment? Semil: Yeah I think about like for example in this new fund, you know, I have some institutional partners. They’re obviously going to be interested in which companies I invest in and would we invest in more capital. You know, and as I’m thinking about like I’ve already made two commitments, I haven’t closed them yet, I’m thinking okay well at some point I’m going to introduce this group to my LPs and how is that going to reflect on me, right? Semil: So just those little things of like the bar goes up and up and, you know, thinking through about like okay why is this person in business, why is she doing this company, how does she carry herself, what’s she going to do to make it work, and how are, how are the LPs going to think about investing in this person, right? Because they’re trusting me to do that. So, so all those things, you know, factor into like a different matrix. Nick: You had just recently written about getting sort of a curve ball late in the process. Nick: Can you talk about what that was? Semil: Yeah. So, I don’t want to, you know, single out anyone, and I think it was a surprise for them, but there was a place that I know that I really like and they had, you know, kind of an internal issue that was a surprise such that they had a personnel change after commitment. And, you know, it was very hard for them in that moment to, to keep that commitment to me because they were a little bit blindsided by the personnel move. And for me, in the moment, you know, I was like oooh, what do, you know, what do I do? And it would have been great to have them as a partner. So it was, it was a curve ball. I don’t think it derailed anything overall. So still very lucky. But kind of in the moment, it’s a little bit unsettling because you invest so much time to build up the relationship. So you kind of, you kind of assume those things will work out. When that happened I remember talking to a lot of people who were very experienced. Fund managers and creators and they kind of told me that no matter how successful they’ve been, in every fund raise there’s always a curve ball at the end. And so you just got to learn to expect it. Semil: No, I didn’t push them because I could tell that they were, they were really surprised by the change in personnel. Like it was, it was amicable and voluntary but it also just kind of shook up their process. And so I kind of felt like pushing it wouldn’t, wouldn’t be the right thing to do, even though my impulse was to tell them like hey, come on, just still do it. So I, I kind of just, I thought about it really hard for a couple days, figured out if I could salvage it and just kind of let it go. Nick: You know, in our, our first interview, you talked about how when you got your start as an investor, you couldn’t get a job at a venture firm. Nick: I’m, I’m sure you’ve had plenty of offers as you built a track record. So, have you in that time kind of ever considered making the jump instead of continuing, you know, with fund 4? Semil: No. I think, yeah, you know, I was lucky, I was lucky. About two little over two years ago I, I got quite, quite a number of offers before doing the third fund, which was really nice. And what I noticed at that time, a couple things. One, once you start writing your own checks, it’s very hard to go back into a structure where the check writing has to go through a larger process. And then, two, just personally I wasn’t sure if there would be organ rejection with me being inserted into like another structure. So I haven’t, haven’t really thought about that, you know, since then, if that makes sense. I’m, I’m actually just not confident I would be the same person or, or thrive like I feel like I’m thriving now and doing what I want to do. I, I question whether I could do that in an established structure. Nick: Yeah, I hear you. Once you’re out on your own for a while and you’ve got your own processes, it’s tough to, to plug into somebody else’s. Semil: Yeah, I think it’s also personality based. Like I just don’t do well in like large groups or crowds or like, you know, I don’t like going to dinner with more than 4 people total. I mean, I, I, I do it from occasion to occasion. But like, you know, where like a conversation, it’s just like more, more and more people around the table even if I really, really like them kind of makes me nervous. Nick: Interesting. Yeah, #Semil, when I sent my fund deck to you, you, many months ago, you said “Awesome and looks good. As I always say, the deck matters much less than having capital partners who believe in you”. For anyone listening that aspires to raise, can you talk about what you meant by this comment? Semil: Your, your deck was good. I just think of it as like what I always say for entrepreneurs and for VCs pitching to LPs is like the deck gets the meeting but, but you, you and your personality have to close the deal. Right? Semil: And, and I, I feel like that line just simplifies the whole thing, which is like send something that people want to meet you. Have other people advocate for you, but when they’re in the room, you kind of, you can’t have a crutch. Nick: You’ve got to close. Semil: You’ve got to close or, or realize that the closing cycle for someone may be really long but you generally like them and take the risk and then invest the time. Nick: You know, you were just writing about sort of key LP takeaways from the Cendana Summit, I think it was. Nick: Can you recap maybe major takeaways that, that you got from that and also kind of combing it with your experience after raising the fund? Semil: The Cendana summit this year was a lot larger. It’s always a great event to see everybody. So it was a lot larger. Then physically there were like 3 areas where people congregated. So I didn’t see as many people. And then the programming was a little bit different in that there were really only two kind of VC kind of nerdy panels. And then there was like a discussion from somebody who’s at human rights watch. And then there was a coaching discussion. So, I think the main thing I got from it, and I mentioned this in the post, is that the rate of new fund formation of the smaller funds just continues to grow. And that there’s this cottage industry around it, around helping people do their administration, helping people team build, helping people scale up their, their business. And so it’s kind of, you know, whereas in a couple years past people may have been saying well what is #Accel doing and what is #Sequoia doing, and they are these big funds that people revere. I think the gap has widened so much and there’s so many funds that that wasn’t really a topic of discussion. It was more like, hey, how do we get from fund one to fund two? Like what shall we do to scale? Like how should we make sure that the partners have the bandwidth to do the work at hand? How do we make sure that we’re building the right team? So it, that to me was like the big takeaway. Nick: So, #Semil, what topic or guest should we feature on the program here? Semil: I think it would be great to have somebody who’s an experienced VC, you know, so has been through cycles, sat on boards, who has converted part of their fund to actually buying these digital tokens and cryptic currencies or whatever you want to call them, and how they think about investing in that and setting up their fund to be ready for that. So I think there’s a lot of chatter, there’s a lot of Twitter talk. I would just love to know what does a, what does a real pro do to set those things up? And how did they sell it to their committee, how did they get the LPAs moved around, where did they hold these tokens? Did they do safts? Why or why not? So I think, I think that would super interesting. Nick: Have you done any ICOs? And did, did you get that question from potential LPs? Semil: I get that question from a few people. And I have basically told them. And I just said look in this fund, I may reserve a little bit to hold in kind of digital tokens but it’s not going to be a core focus, but in the future you should expect that that may be the case. I have. I have participated in a few, both as an individual, I have made a couple of fund investments that also exclusively focus on this. And I’ve invested in companies that have subsequently launched their own token. Nick: How do you think about that differently versus just your standard, standard equity investment? Semil: I think there’s this narrative that, that will hurt VCs. And I actually think the instrument will be better for VCs because you don’t need access. You can just kind of move on your own impulse. You can publicize your position and get to know the team and work with the team. And if you feel like the team isn’t communicating or doing the right things or you don’t, you lose faith in it, you can get out. So their permissionless nature, moving in and out, I think is just fascinating and so orthogonal to how venture is. Now, now it brings up a whole other, you know, host of issues that we have to figure out. And I think it will take decades to figure out. But it’s, it’s, you know, you can’t, can’t argue with the organic momentum of what people are building in that space. Semil: Well that, that could be a whole other podcast because I mean, I think his whole, their firm’s trajectory of like being interested in #Bitcoin and then leading, leading them to #Coinbase. And then that leading them, you know, the first employee at #Coinbase was #Olaf, who started #Polychain. You know, he had an insight about these digital currencies. And then their analyst, #Joel, had this insight about the inversion of value between protocol and application. And then them putting, you know, not only their part of their fund into these digital tokens but then teaching their current companies like #Kik to, to have a token sale and use that as an incentive mechanism. It’s just so like next level to the 100th power from what any other venture firm is doing. It’s fascinating. Yeah, I, I actually, I actually told a reporter who was looking for like an interesting venture story like what should I go look at? And I’m like go figure out what their portfolio construction is right now because it is so fascinating how they got to where they got to here in like 3 or 4 years, you know, could be an epic story. Nick: Yeah. In light of the fund you just raised, who, who helped out most and, and influenced you most during that process? Semil: Oh, I mean, there’s just too many people to mention. And if I didn’t mention them all, I think I, honestly it’s like the, the, you know, it takes, it takes a village of VCs to help you raise a fund. I mean, that’s probably a good blog post title. You know, every, every VC that I have a good relationship with helped out. Every single one pretty much. Whether it was just picking up the phone and, you know, me pitching about some part of the process to, to, to really actively making phone calls or grind, helping me grind it out. It was, yeah, it was, it was a, a full court press. Nick: Got you. And then, what, just to wrap up here, what’s the best way for listeners to reach out and connect with you? Semil: I think Twitter or through, you know, somebody I know well. And, you know, it’s, with having 3 little kids, it’s hard for me to just like meet everybody. But I always try to be available on, on email. And, you know, the more specific the question, I always try to get an answer back. I feel bad that, specially in this fund raise and then, then having with, with kids and sort of commuting around, it’s just hard for me to go have as many random coffees as I did a few years ago. And so I just try to, try to make, you know, try to mention to people why, why that is. But I still want to always be accessible and, you know, I really the email medium. So people can email me anytime if they have specific questions. Nick: Awesome! Well, he is #Semil Shah. The #Haystack blog is at blog.semilshah.com. #Semil, thanks so much for, for coming on the program again and for deconstructing the raise of fund 4. Semil: It’s a podcast therapy. Nick: thanks #Semil. I look forward to chatting again soon.